But before long, performers begin disappearing and bodes are found mauled by an invisible beast. Mara realizes that there’s a sinister presence lurking in the town with its sights set on getting rid of the sideshow freeks. In order to unravel the truth before the attacker kills everyone Mara holds dear, she has seven days to take control of a power she didn’t know she was capable of―one that could change her future forever. Set against the backdrop of the 1980s, Amanda Hocking’s first stand-alone novel for print takes inspiration from Pretty in Pink and The Lost Boys, making it a New Wave take on Gothic Romance. Freeks has been a huge passion project of mine. It was something I wrote for myself, so it has a killer soundtrack – which you can check it out: here – and I am crazy excited for you all to read it. 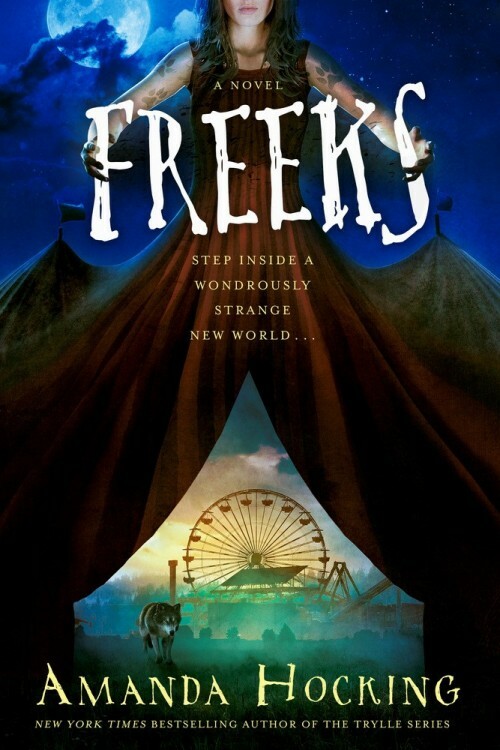 The hit Netflix series Stranger Things is definitely inspired by many, many of the same things that inspired me to write Freeks (although the two stories are vastly different). So if you like Stranger Things, you may enjoy Freeks. Grabbed it at the store and wanted to read it a bit, actually read like 5 to 6 pages!! Now the book is at home with me ready to be read!!! I just bought this book yesterday and I can’t wait to read it. Sounds so twisted and different. I’m so excited to pick this up!!!!!! I love your novels and I’m pretty sure I will for a very long time! I just it’s out in Australia soon! Will this be a stand alone book or will there be sequels to come?